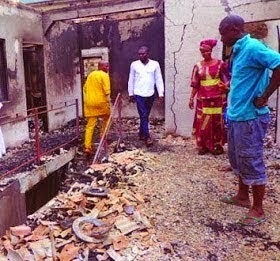 Mr. Ngozi Chilekezi and his wife, Patience alias Oil, were burnt to death in the Umuodo community of Itu, Ezinihitte Local Government Area of Imo State last weekend.According to the Vanguard, the couple had lived together as husband and wife for about 12 years before the well executed murder by the wife. The late woman had allegedly planned to elope with another man but the plot leaked to her husband, who allegedly confronted the strange man and started making plans to take another wife.Fortunately, the husband, who was badly burnt at the time he was rushed to a nearby hospital, was able to narrate what happened to his relations before he died.Late Chilekezi said he was invited last Saturday into their living room by his wife at about 1.30 p.m. for a chat. “On entering the room, his wife poured fuel on him, lit a match and held him tightly to ensure that he did not escape from the evil plot,” a villager recounted. The villager equally told Vanguard that Chilekezi, a relatively comfortable automobile technician, managed to extricate himself from his wife’s grip and ran out of the burning house and was taken to a nearby hospital for medical attention.The dying man also told his relations that his wife was equally trapped in the burning house but before people could get back to the house, the woman was already burnt beyond recognition.At press time, the charred remains of Mrs. Chilekezi was still in the burnt house, while the husband’s body had been deposited in an undisclosed morgue.Confirming the incident, the Police Public Relations Officer, PPRO, Mrs. Joy Elemoko, a Deputy Superintendent of Police, said a crack team of detectives from the state police headquarters had swung into action.